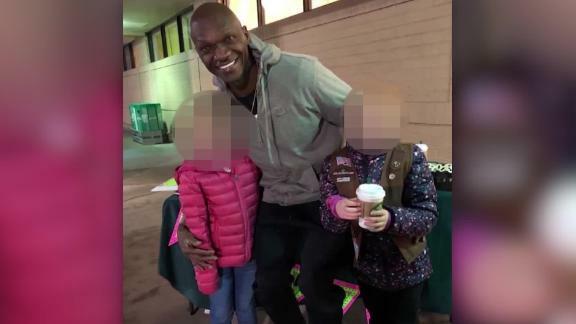 A man who was praised for buying $540 in cookies so two Girl Scouts could escape the cold has been arrested on federal drug charges. Detric McGowan went viral over the weekend after he spent $540 to buy the cookies from two girls so they didn't have to stand outside a grocery store in Greenville, South Carolina. A picture of McGowan posing with the two girls was posted on Facebook by the girls' cookie manager and shared thousands of times. The story even picked up national coverage, including from CNN. Tuesday morning, authorities arrested McGowan on several charges, including conspiracy to manufacture and distribute heroin, cocaine and fentanyl. Although McGowan's lawyer, Janis Hall, didn't comment on the case, she did tell CNN she believes he's a good-hearted person. The DEA official said the viral photo from this weekend had nothing to do with the agency's federal drug charges stemming from a grand jury begun in 2018. The Girl Scouts said it was saddened to learn of "the unfortunate turn of events in South Carolina." It's not clear if the Girl Scouts will have to return the money they received. CNN has reached out to them to ask but has not heard back. "We want to assure the public that all of our girls are currently safe, that all proper safety protocols were followed during the sale, and that at no time were any of our girls or volunteers threatened," the organization said in a statement. "The troop had no way of knowing who they were dealing with, and every reason to assume a good Samaritan wanted to help power amazing Girl Scout experiences through the Girl Scout Cookie Program."